Italy’s Renato Paratore defends the European Tour’s Nordea Masters at the Hills GC in Gothenburg this week against a field including Martin Kaymer and Thorbjorn Olesen. The European Tour heads for Sweden this week and the 28th running of the Nordea Masters. Italian youngster Renato Paratore is the defending champion at the Hills GC in Gothenburg. This event has moved back in the schedule this year. Since 2012 it had been hosted in late May to early June but this year it has shifted to be contested the week after the year’s final Major – the USPGA Championship at Bellerive GC. After making the cut in St Louis, two-time Major champion Martin Kaymer has made the journey to Sweden. Thorbjorn Olesen of Denmark, who also played the weekend of the USPGA, will also start at Hills GC. The home nation of Sweden will be well represented with former European Tour Number 1 Robert Karlsson on the start list together with 2018 European Tour winners Alexander Bjork and Joakim Lagergren. Marcus Kinhult, Johan Edfors and Freddie Jacobson will all play. This tournament began life as the Scandinavian Masters back in 1991. That event was won by Colin Montgomerie and, since then, Nick Faldo, Vijay Singh, Lee Westwood, Adam Scott, Luke Donald, Graeme McDowell, Alex Noren and Matt Fitzpatrick have been amongst the champions. Last year, young Italian Renato Paratore claimed his first European Tour title at Barsebäck Golf and Country Club. Paratore held off the challenge of Chris Wood and Matt Fitzpatrick to secure the win. There’s a new venue for this year’s Nordea Masters – Hills Golf & Sports Club is the venue as the event returns to Gothenburg for the first time since 1996. The course at Hills GC was designed by Arthur Hills and opened for play in 2004. The weather forecast looks a little glum with rain likely to be a factor every day. Not a Sky Sports customer and want to watch the Nordea Masters? Thorbjorn Olesen – The Dane has been enjoying a fine season and is currently sixth on the Race to Dubai standings. He was tied third in the Bridgestone Invitational and is currently just outside the automatic qualifying places for the Ryder Cup. A win here could see him earn his spot. Alexander Bjork – Already a winner this year in the Volvo China Open, the Swede would love to win on home turf. He’s been on fine form and is currently 18th on the Race to Dubai standings. 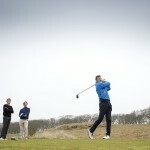 Robert Rock – An outsider but a consistent performer who has shown glimpses of excellent golf this year. He looked great through 36 holes of the Scottish Open as an example. If he can put four good rounds together he could contend.